Here we have a chance to talk to the creator of one of the best indy comics "Blokes Terrible Tomb Of Terror", Jason 'The Bloke' Crawley. Q1: It's not very often you see people going the comic book route these days, what made you do it? To start with I'd just like to say thank you for wanting to do this interview, it's greatly appreciated! With the comics, I've always had a fascination with horror which started as a young kid and after meeting a friend of mine, Ju Gomez on MySpace, back when people used that as the main social/networking site, he asked me if I'd be interested in helping him produce a comic he was doing. At that point I had never done any comic work but was really interested in trying, so I spent time looking at guides on-line and YouTube videos to learn how to do things like lettering the pages, which was actually what I started doing before moving onto trying my hand at writing. It quickly became something that I had a real passion for and it evolved from there. Q2: How did the idea of an anthology come about instead of one big story? Some of my favourite horror films are the old Amicus anthology movies, as well as being a huge fan of the old anthology magazines like "Creepy" so it made sense to me to try and do something along these lines, plus the fact that I find it a lot easier myself, to come up with short story ideas rather than one continuous one that would pan out over a number of issues. Q3: How did you come up with the idea for your character "The Bloke"? Well this actually started as a nickname which was given to me by work mates after I moved to the US from England. I would be asked what different words and phrases mean all the time and once I was asked what a Bloke was, the name stuck and it's been that way ever since so once the idea for doing a comic and later on, the magazine came about I went with the Bloke titles as I was self publishing them myself as well as writing most of the stories and also now hosting the magazine. 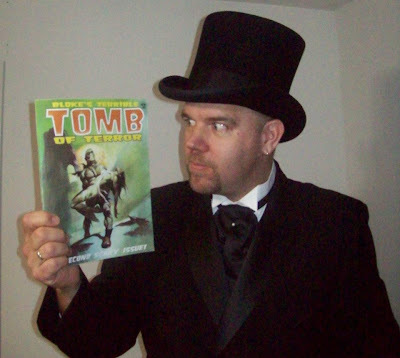 This has led now to me appearing at shows to promote the magazine dressed as The Bloke, the host of Bloke's Terrible Tomb Of Terror who is basically a British Undertaker character version of myself. It's a great deal of fun to do, along with the fact that it draws more attention and interest to my table as people walk by. I recently started a section in the magazine called "I Met The Bloke" which features photos taken at shows with me and people at my table. Q4: Did you take any inspiration from past films, comics or books? Absolutely. As I mentioned earlier, I love the old anthology films and magazines so a great deal of inspiration comes from those, but at the same time I try and incorporate other things to try and bring something new to the plate, so that hopefully the magazine will appeal to a wide audience of readers who are looking for something different than everything else that's produced. 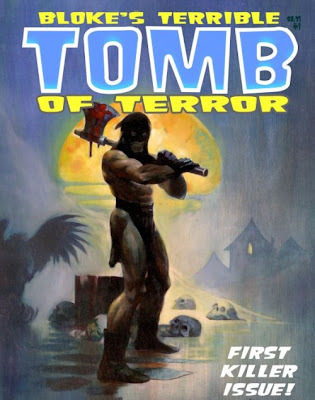 I think we have managed to accomplish this to a point already in the fact that Bloke's Terrible Tomb Of Terror is magazine size, rather than comic book size as you rarely see that format being used nowadays for this kind of project. Q5: You've had some amazing artists draw for you such as Lou Rusconi & Mike Hoffman, how did that come about? Yes, I have been very fortunate with a lot of the artists I have worked with as it's one thing to come up with all these story ideas, but it takes the skill of the artist to bring that story to life with their illustrations. To all of the artists I have worked with over the last few years I would like to say thank you for your time and work in helping me produce these books. With Lou Rusconi, again like Ju Gomez, we originally met on MySpace and I had recently started the comic book series with Ju as "Virus Comix" called "Bloke's Tomb Of Horror" and after the first couple of issues which featured stories written by me and others, I wanted to try and produce a book made up of all stories written by myself so I came up with the idea for the "Blokes Tomb Of Horror 2010 Halloween Annual" and posted a blog on MySpace asking for any interested artists to contact me about drawing stories. Lou was one of those who did and he went on to draw my story titled "Portrait Of Death". The Annual went on to be voted Best Anthology 2010 in the Comic-Monsters Horror Comic Awards which was voted for by fans on Facebook as by that time everyone had shifted from MySpace to Facebook. It was also this book that led to me working with Mike Hoffman as he had read a copy that I had sent to him and he offered to illustrate a story of mine for the 2011 Annual. After this he had made plans to go on a trip down to South Carolina and on his way there he stopped at my house to meet me and we had a great time discussing all kinds of things and obviously comics! He was aware of the passion I had for what I was doing and asked me if I would be interested in working with him on an anthology magazine which we would self publish and after I picked my jaw up off the floor I said yes! Haha! If it wasn't for Mike and his commitment to Bloke's "Terrible Tomb Of Terror", I wouldn't be where I am today and I owe him a great deal for everything he has done. He took it upon himself to help me get my name out there by being associated with him and his amazing work and for that I will be eternally grateful. Q6: You've been doing the convention circuit for the comic, how has that been? I did a few shows at the tail end of 2011 and it was obvious then that there was interest in our magazine, but it was once I started to appear at shows dressed as 'The Bloke', that the interest really started to bloom, especially now that there are currently four issues available with a fifth coming out this Halloween. People could see that this wasn't a one off publication and that it was a continuous series, so I have people coming up to my table now looking for the latest issue as they have all of the others. I'm also an avid promoter of the magazine on Facebook, so people are always up to date on show appearances and what's coming up in future issues, which keeps the interest peeking. I like a lot of different genres of film and it would be hard to pin point favourites, but obviously Horror is the big draw for me and actors I truly admire would have to be from the classic days of Horror like Bela Lugosi's portrail of 'Dracula' and Boris Karloff's version of 'Frankenstein'. Elsa Lanchester played the monsters bride in 'Bride Of Frankenstein' and although she has the shortest screen presence in any Universal Monster Movie she is by far my favourite of the monsters from those golden days of film. Vincent Price, Christopher Lee and Peter Cushing are actors I could watch all day too. Horror seems to be a much more widely accepted genre nowadays and this can be seen in all the PG rated films that come out but something I'm not really impressed with is the sheer amount of remakes that come out. Some work, while others fail completely and should have just been left alone. I just don't understand why there is so much of it around these days, surely Hollywood hasn't run out of writers with original ideas has it? Who knows! In recent years some of the best films have been coming out from across the sea from countries like France and Spain, so while Hollywood continues to drag up ideas from the past I will find my comfort in watching what is coming out elsewhere as they are doing a good job about it! It's quite simple really, if you find that this kind of work or anything else for that matter, is what you want to pursue in life, then go for it! There's only one person holding you back from achieving your dreams and that's you! It's a lot easier to get into doing this kind of thing now thanks to the print on demand aspect so that you don't need to be ordering huge amounts of books at any time which leaves you with more option to put what you can into the production of future issues, while still being able to get copies of your books whenever you want them. This side of things has really helped me out over the last few years and is the only way that I myself can afford to do this. I would just like to say a huge thank you to all who have supported what I do, especially my poor wife who sits back watching TV on her own a lot of the time while I'm working away on the computer! Without this support and those who buy the magazines, I wouldn't be here today doing this interview or enjoying the time at shows as 'The Bloke'. So to all of you, thanks so much, I truly appreciate it and hope I can carry on producing something that you all enjoy! Cheers!